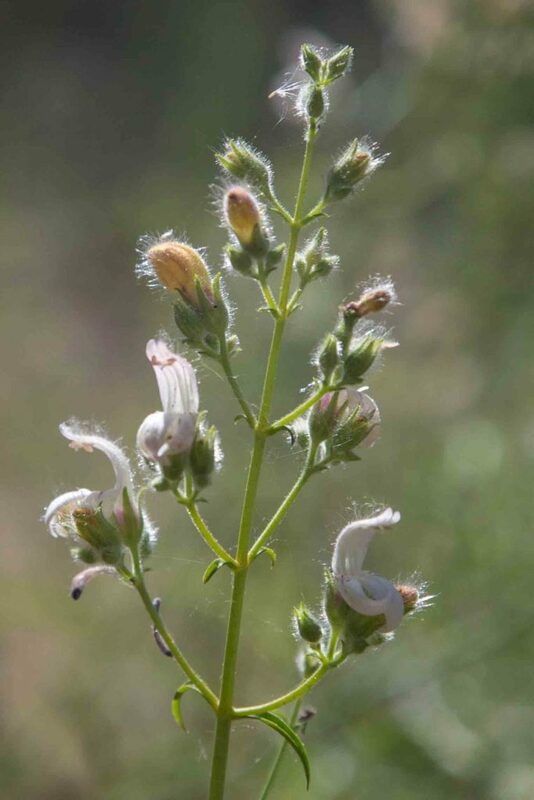 A common plant, with distinctive interrupted whorls of 3–5 flowers giving the plant a somewhat pagoda-like appearance. 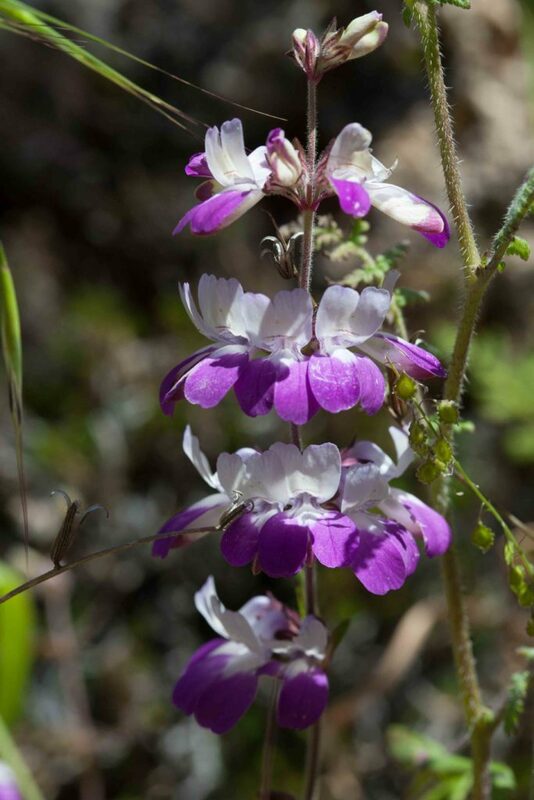 The flowers are typically pink-purple but are quite variable, sometimes even pure white. 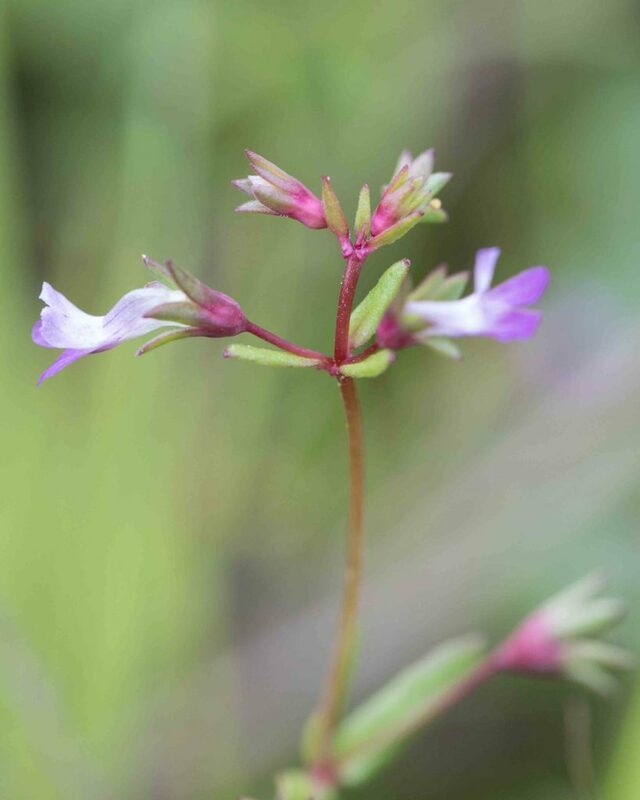 Each flower appears to have 4 lobes, two upper (which are generally paler than the lower) and two lower. 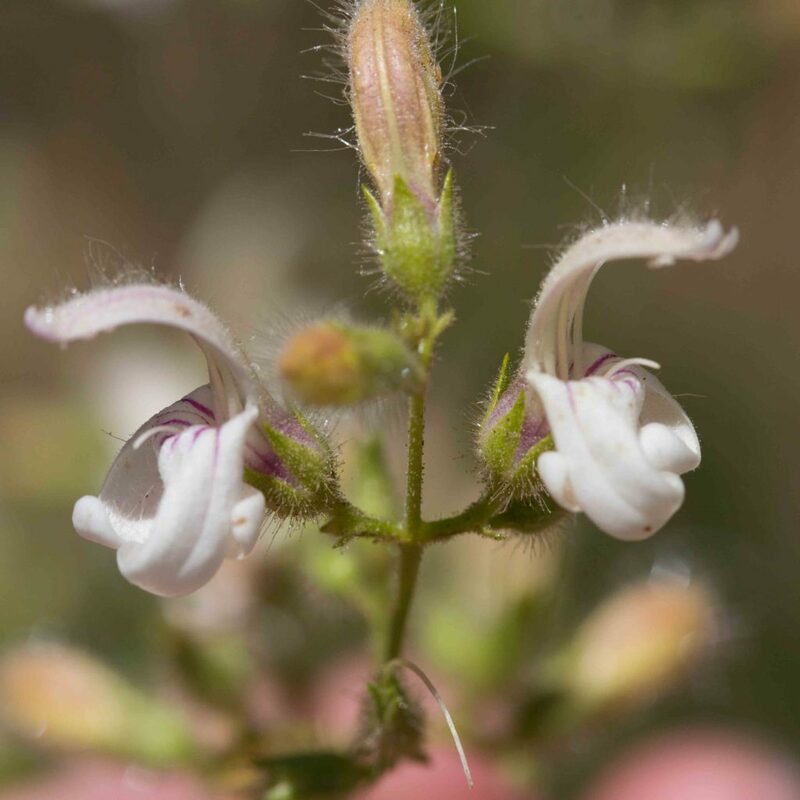 In fact there is a third lower lobe, hidden between the other two, keeled and enclosing the stamens and style. 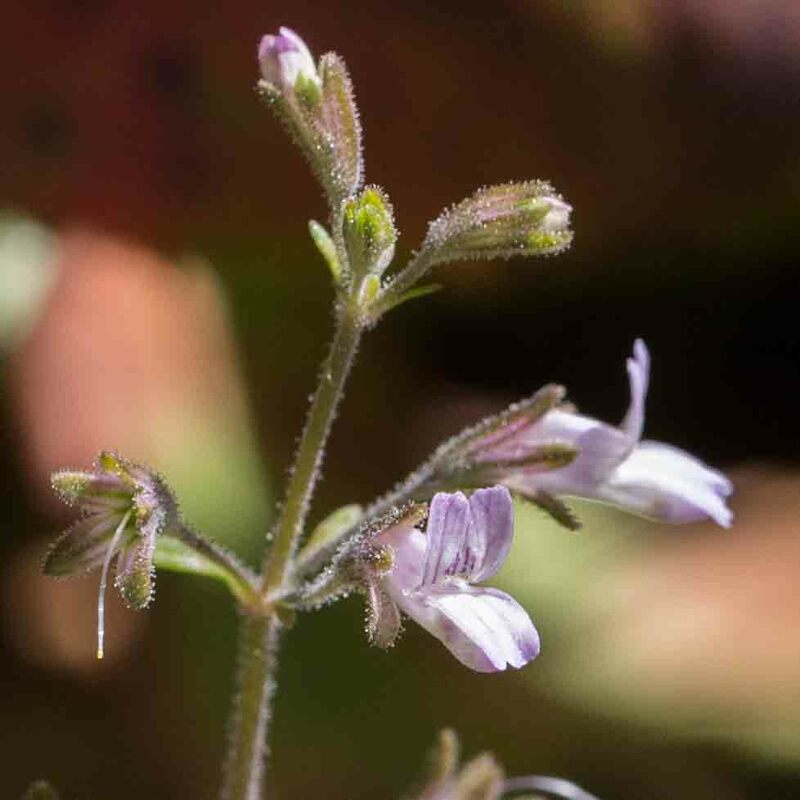 The leaves are lance-deltate, opposite and sessile on the straight stem. 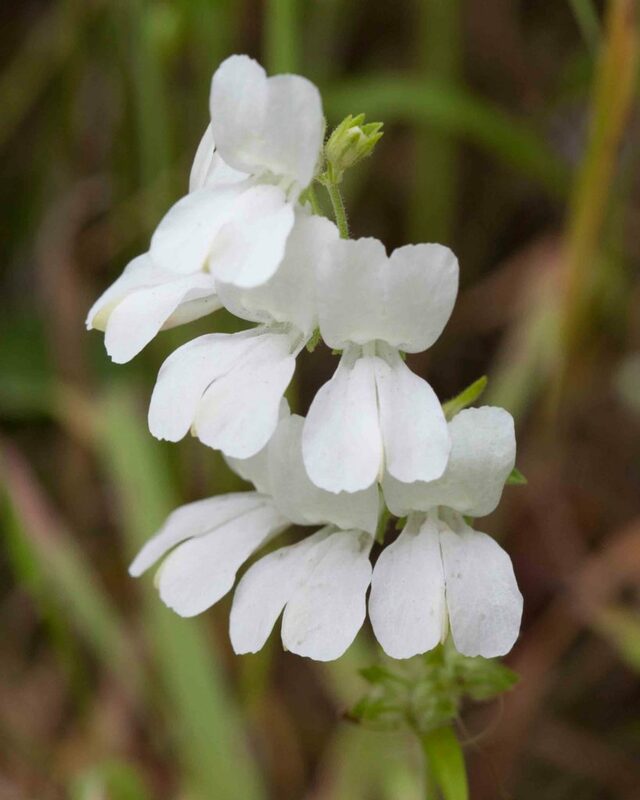 An uncommon plant, erect with small, 6–9 mm, white to pale lavender flowers in a loose whorl, quite different from the pagoda-like whorls of Chinese Houses (Collinsia heterophylla). 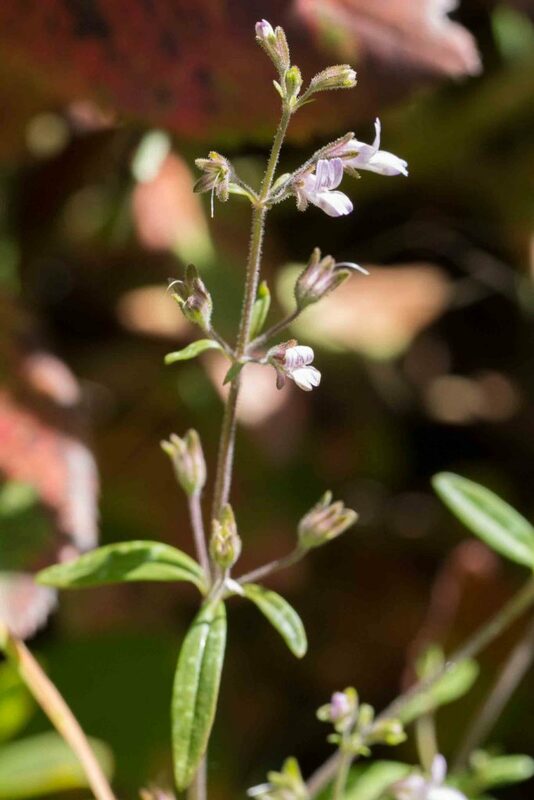 The leaves are oblong to oblanceolate, opposite and with tapered bases. 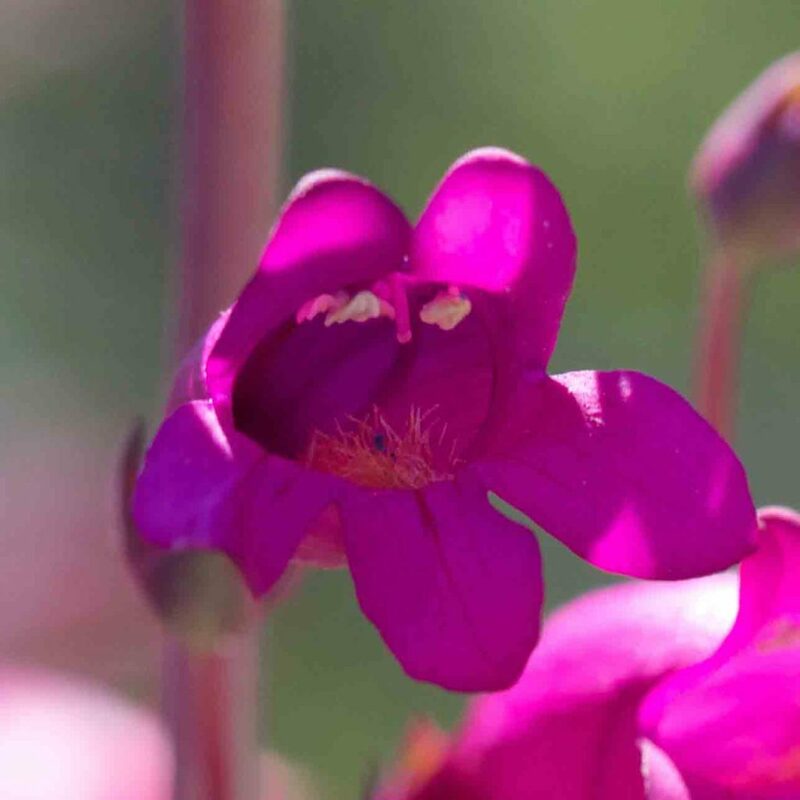 The flowers are conspicuously glandular, 2–5 per node with pedicels longer than the calyx. 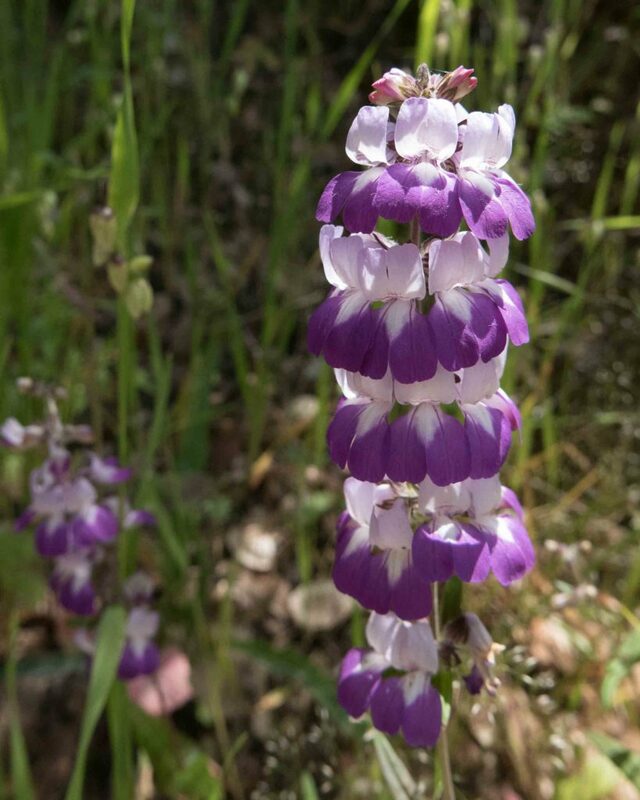 An uncommon plant, found mostly in the southern part of the county but also found near Mt Toro and inland along the Carmel Valley Road. 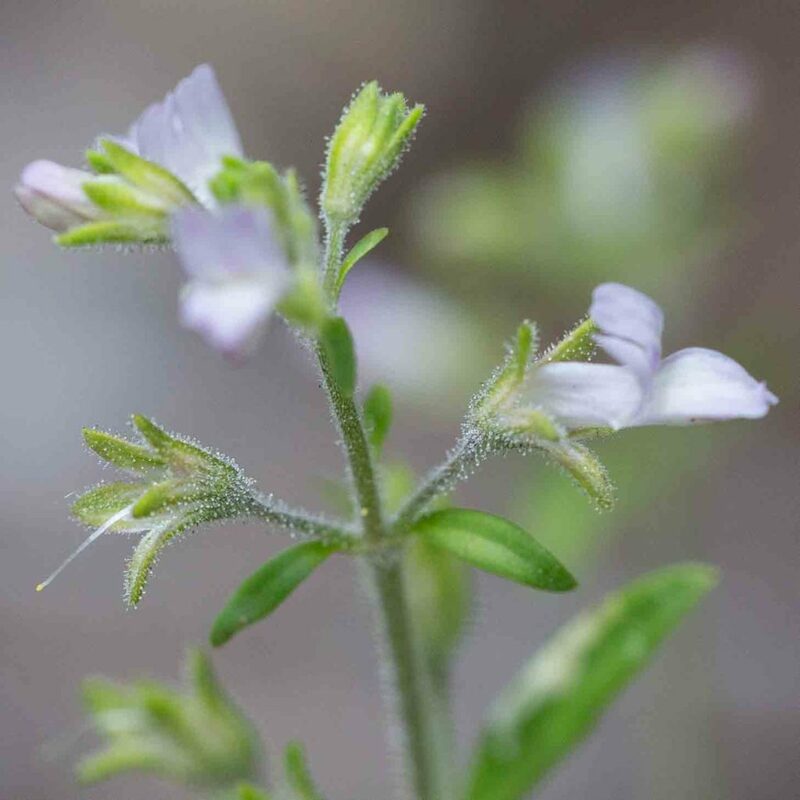 It is distinguished from Child’s Blue-eyed Mary (Collinsia childii) by its acute-tipped calyx lobes, its few flowers (1–2 per node), its lack of glands and its smaller size. 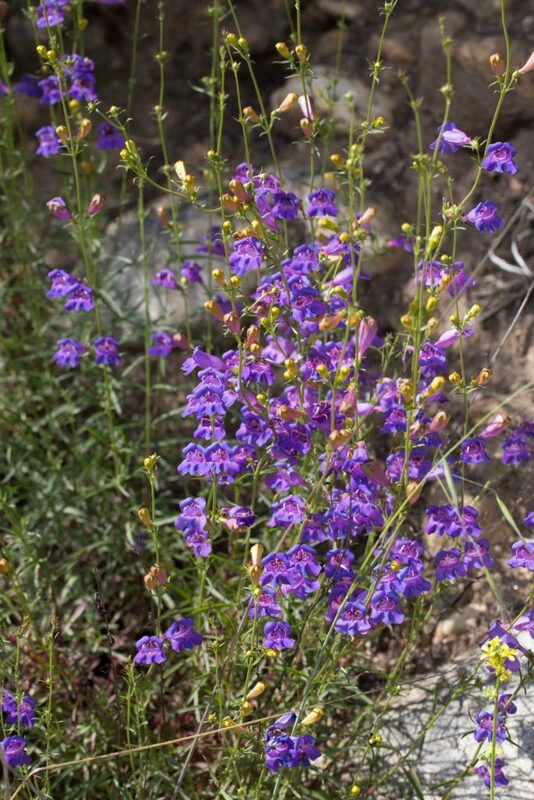 The corolla is 5–8 mm, generally lavender to purple, often barely angled to the tube. 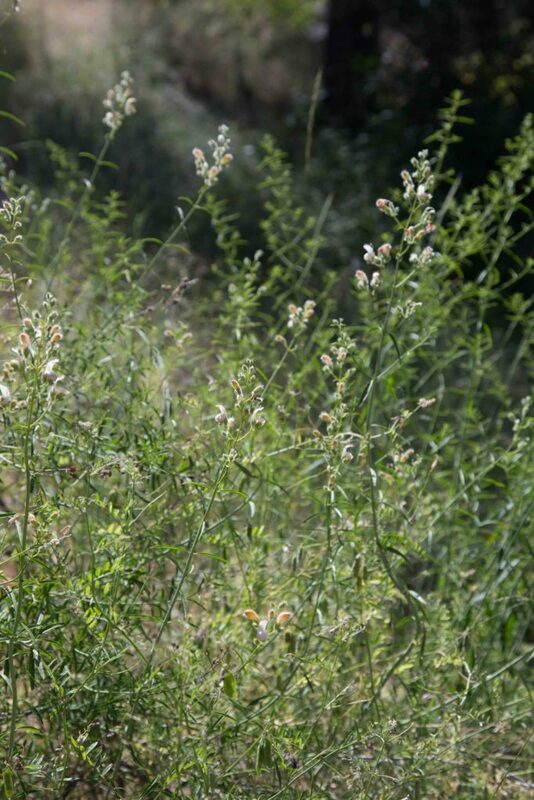 Leaves are linear to oblong. 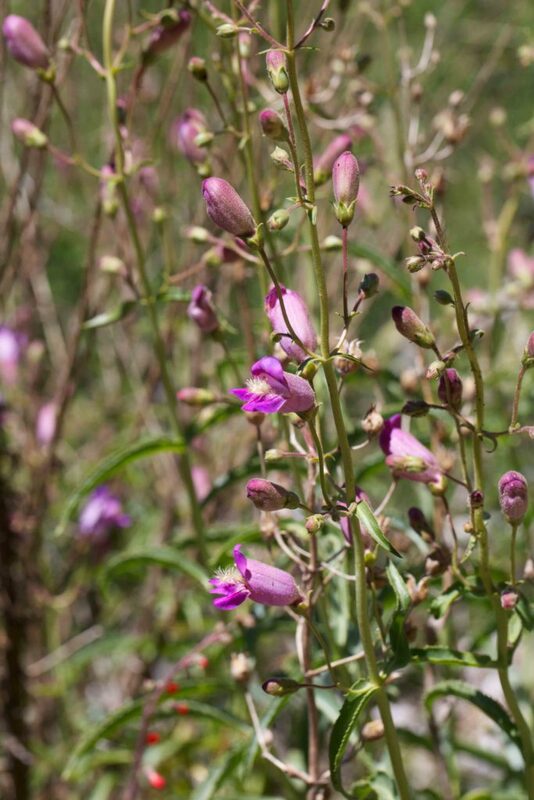 This is a large, many- and loosely-branched, many-flowered shrub. 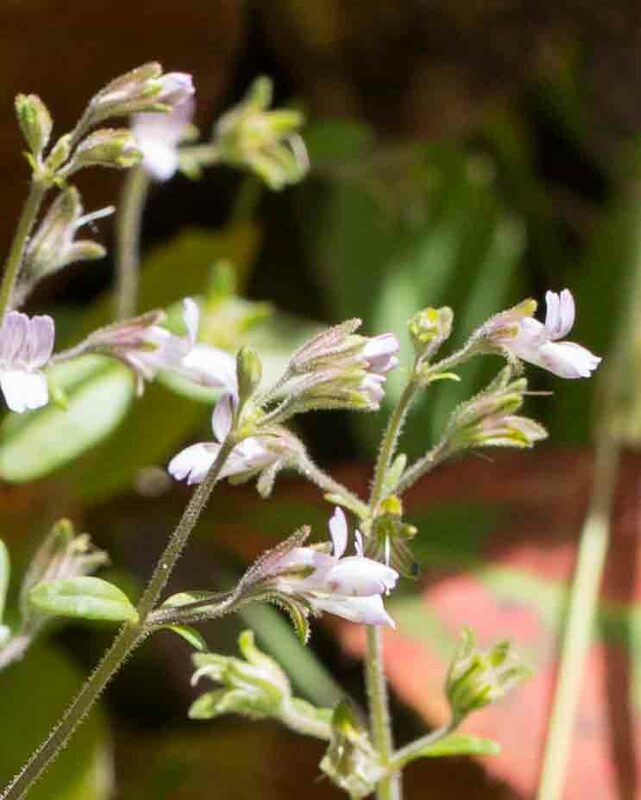 The flowers are whitish to rose-tinged with purple stripes and strongly 2-lipped, the upper lip appearing more or less hooded. 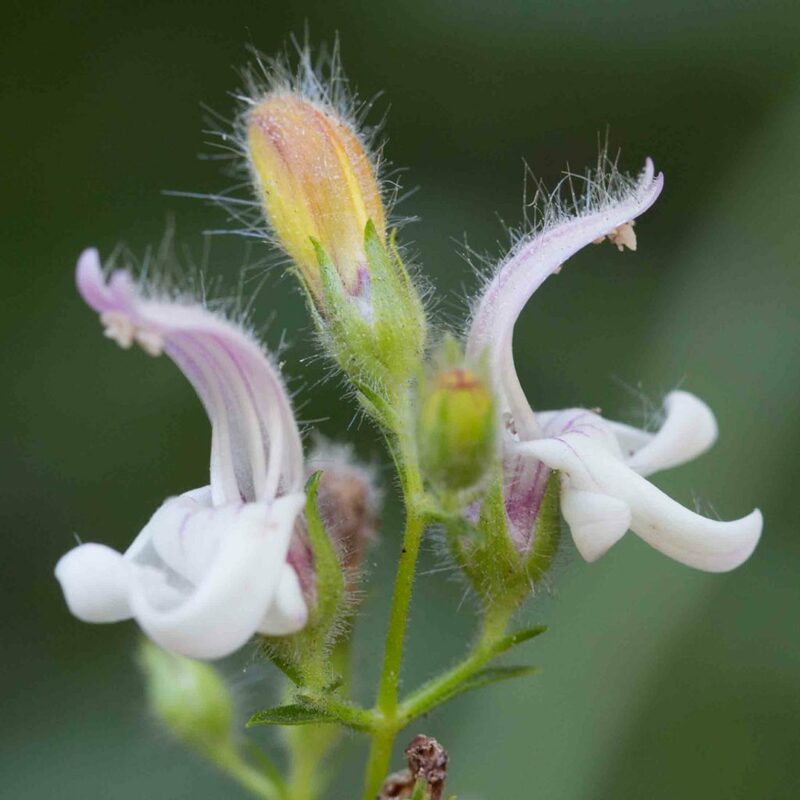 The lobes are glandular-hairy. 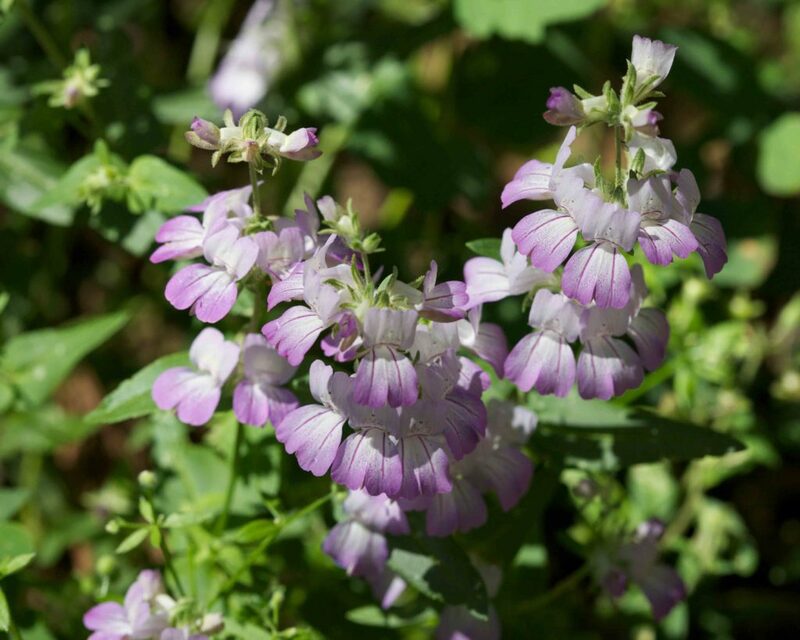 There are 5 calyx lobes, acute, equal and glandular. 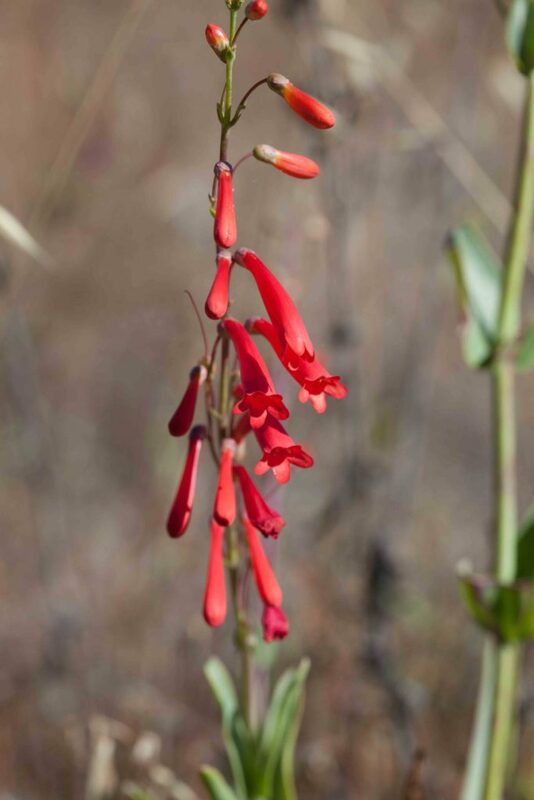 This is immediately recognizable with its tall stems bearing pendulous, fiery red, tubular flowers, each 2–3 cm long with 5 more or less equal ovate to rounded lobes. 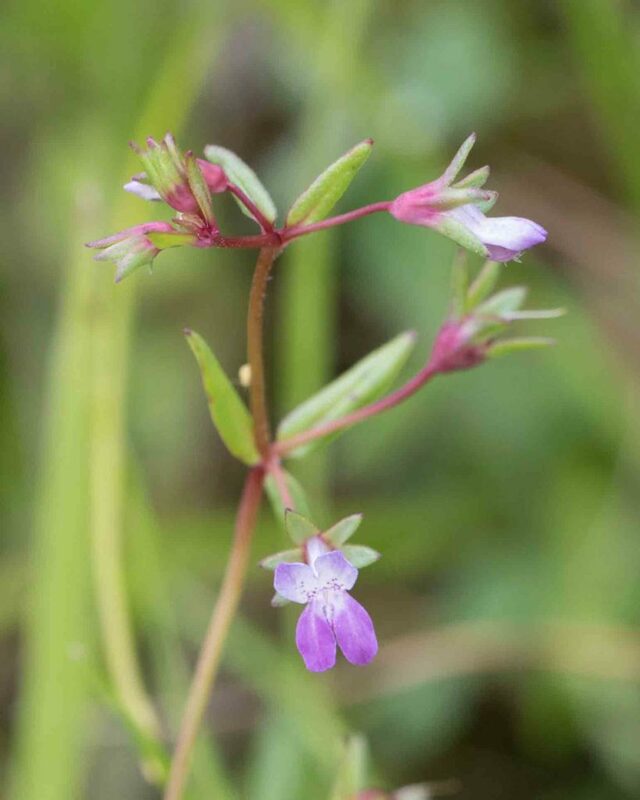 Thick, lanceolate to ovate leaves clasp the stem. 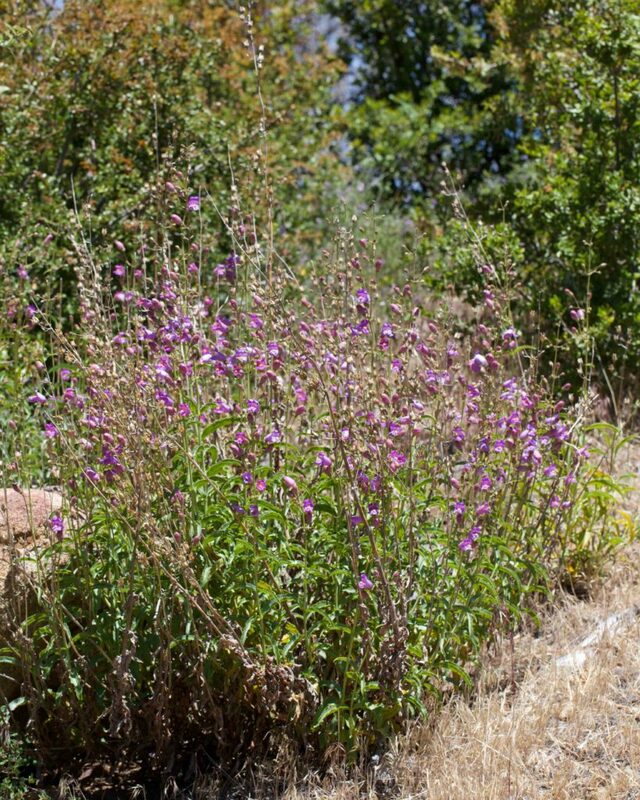 Centranthus is the genus name of the common Red Valerian and centranthifolius means valerian-leaved because of the similarity of the leaves of the two plants. 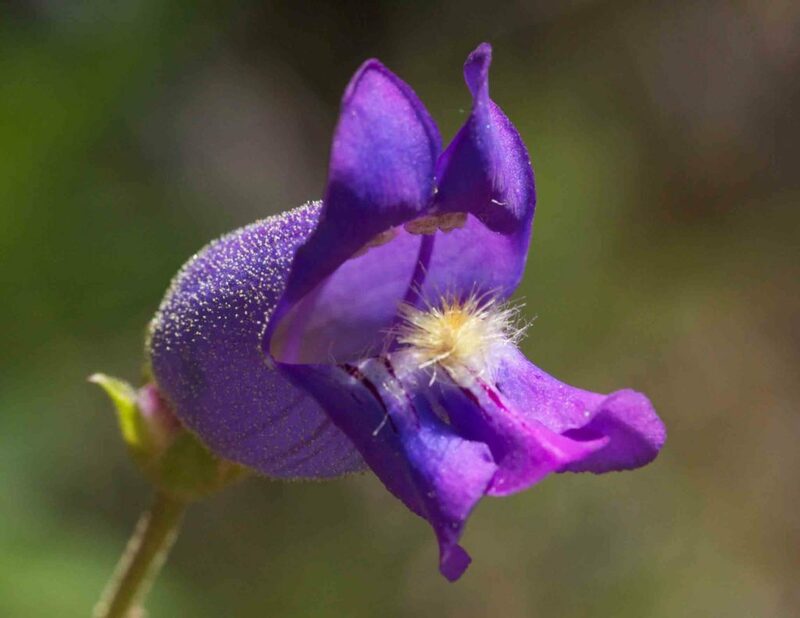 This has broad, bluish-purple tubular flowers with three lobes on the lower lip. 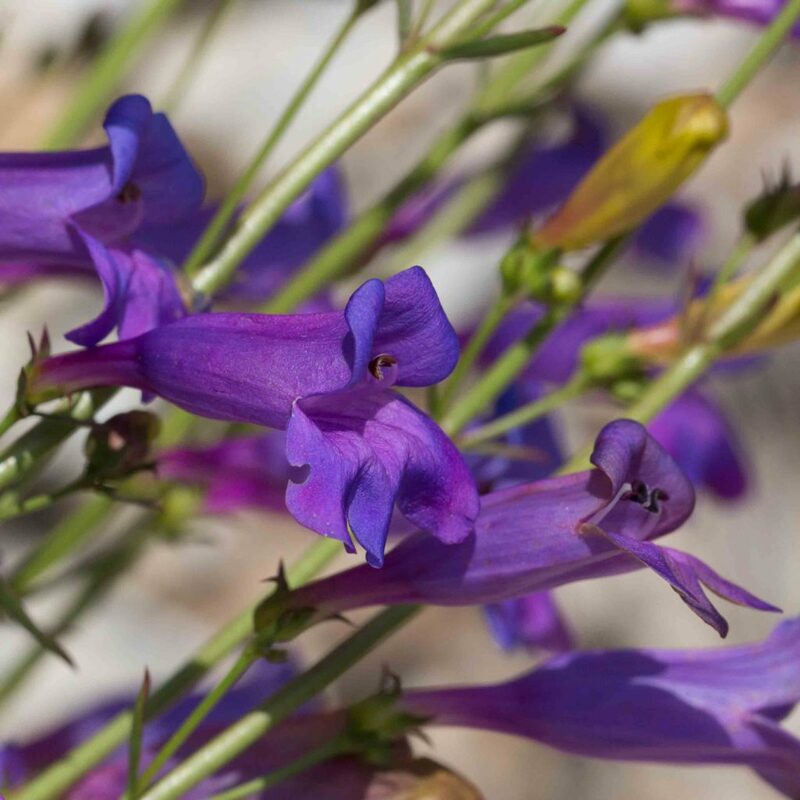 The tube expands gradually from its base and there is no “beard” on the tongue as with Grinnell’s Penstemon (Penstemon grinellii). 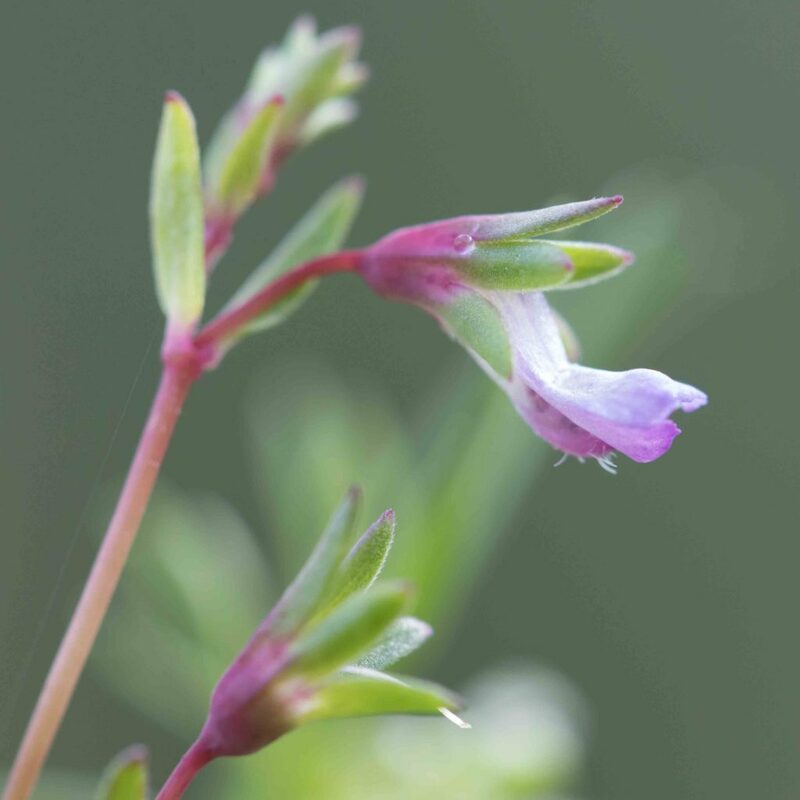 The yellow buds are a distinctive feature. 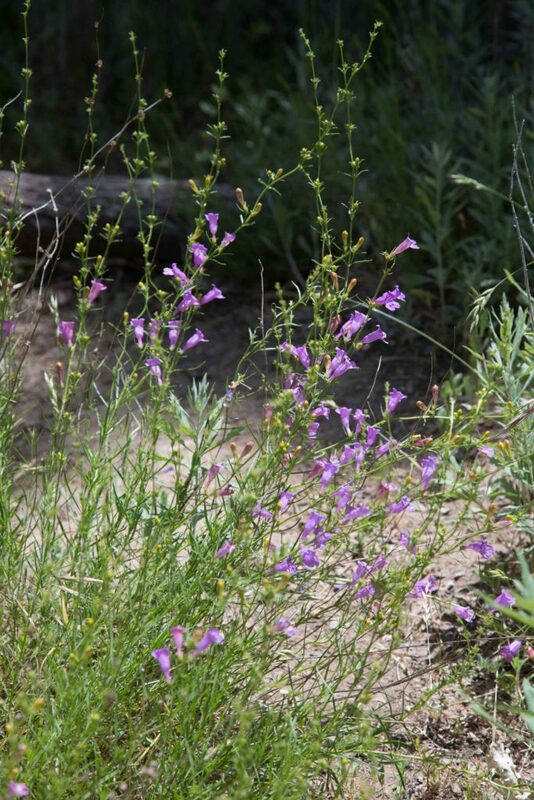 The plant is glabrous with leaves that are linear to narrowly oblanceolate. 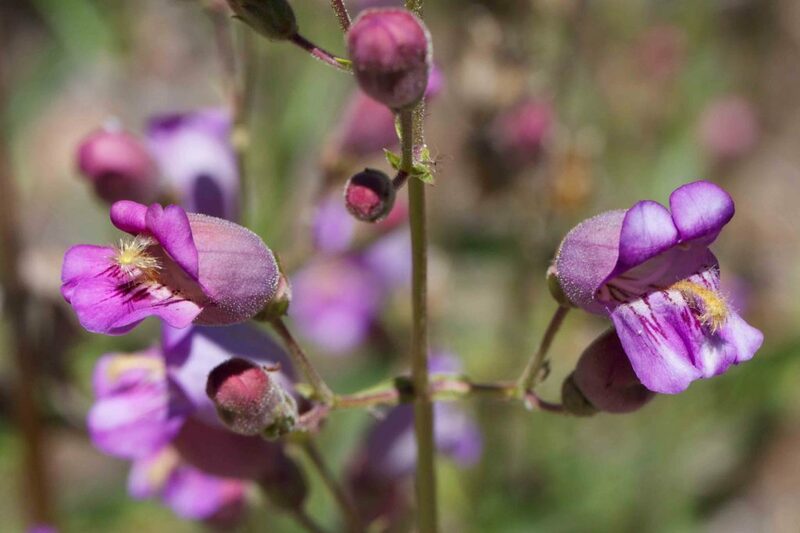 This has broad, pink or blue-violet tubular flowers which expand abruptly from their base and have dark stripes on the lower lobe and a distinctive “beard” on the exserted sterile stamen (the “tongue”), hence the alternative common name of Grinnell’s Beardtongue. 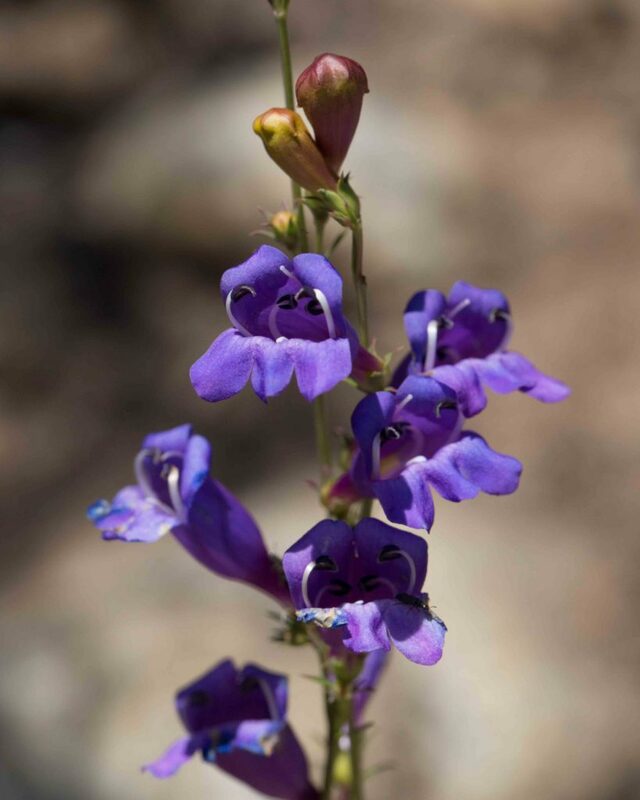 The pink buds, the abruptly expanding tube and the beard all serve to distinguish this species from Chaparral Penstemon (Penstemon heterophyllus). 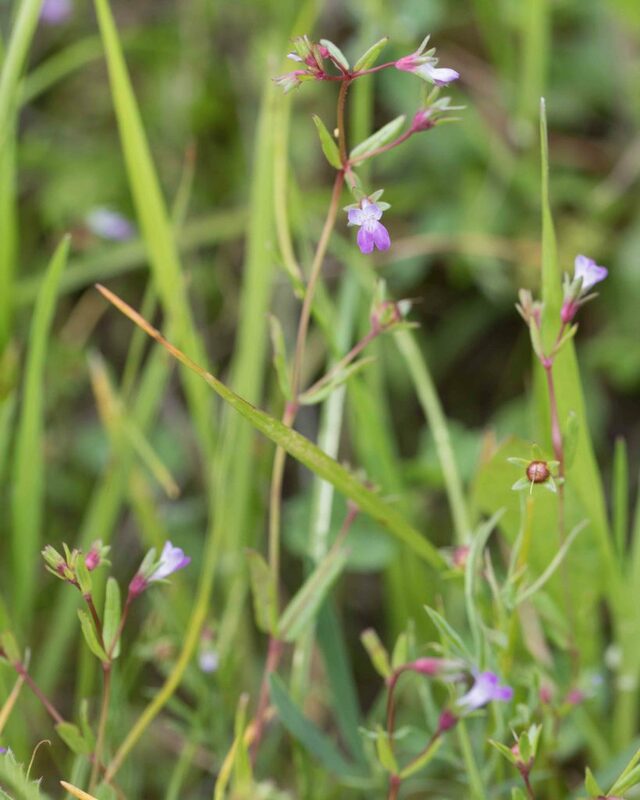 Leaves are lanceolate, often arching and dentate. 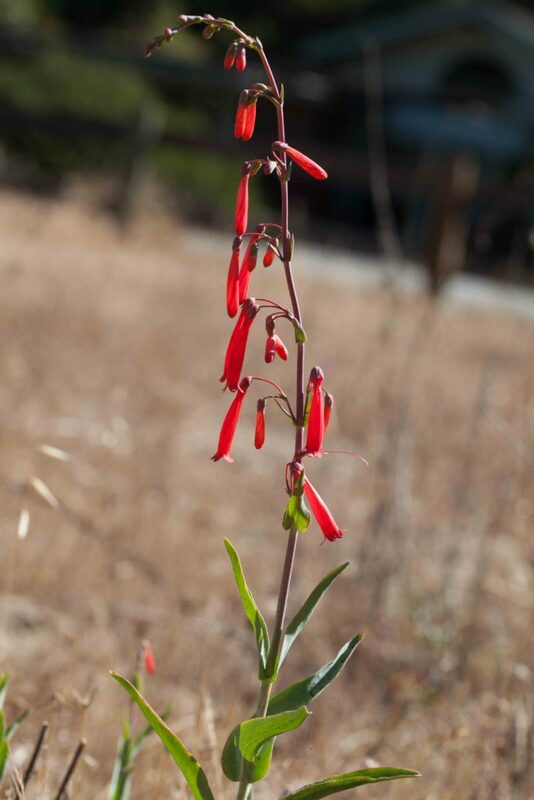 This appears to be a hybrid between Grinnell’s Penstemon (Penstemon grinnellii) and Scarlet Bugler (Penstemon centranthifolius), which, according to Jepson, would be assignable to Penstemon xdubius if recognized taxonomically. 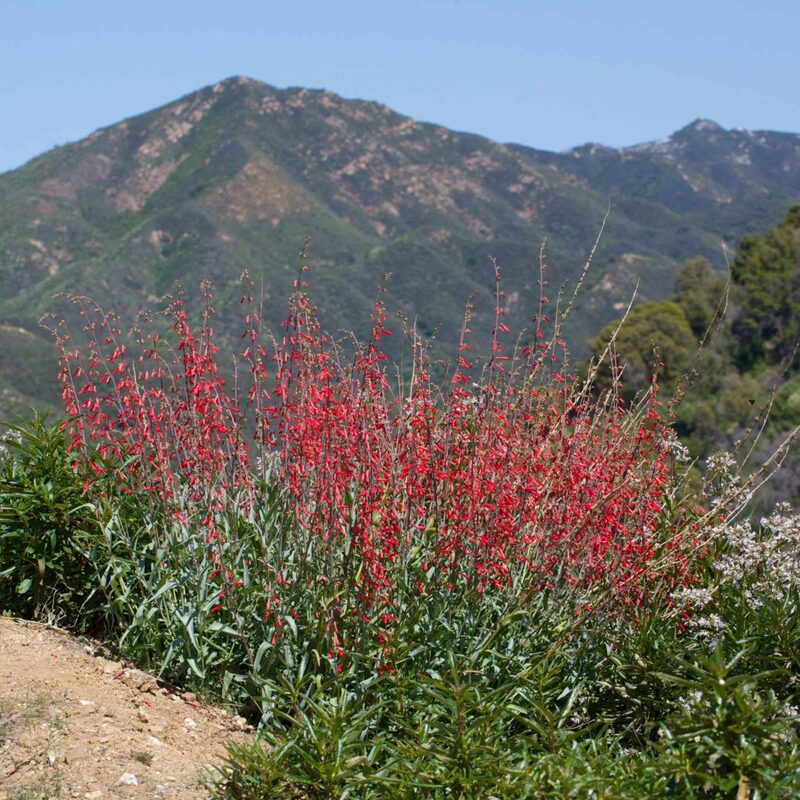 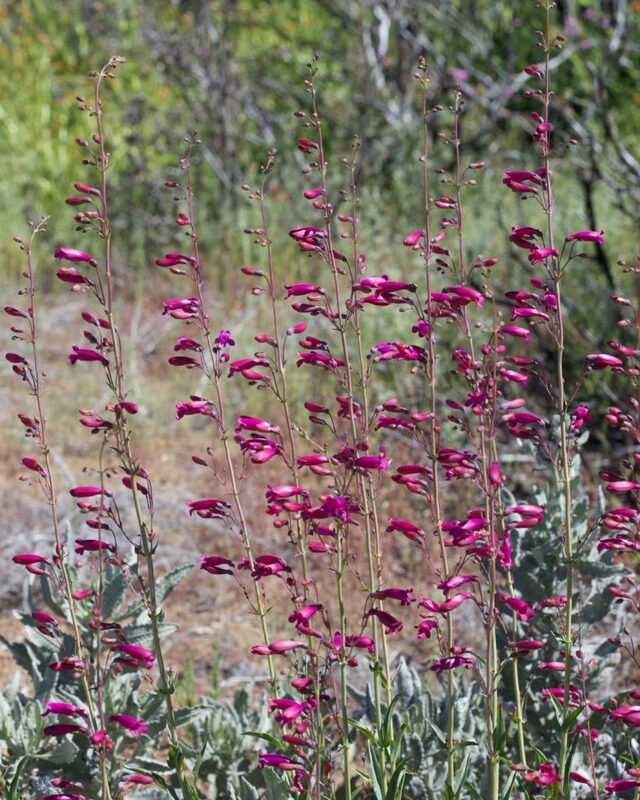 It is regularly found near Black Butte off the Tassajara Road, though there are some years when it is not to be found and in its place there is nothing but Grinnell’s Penstemon. 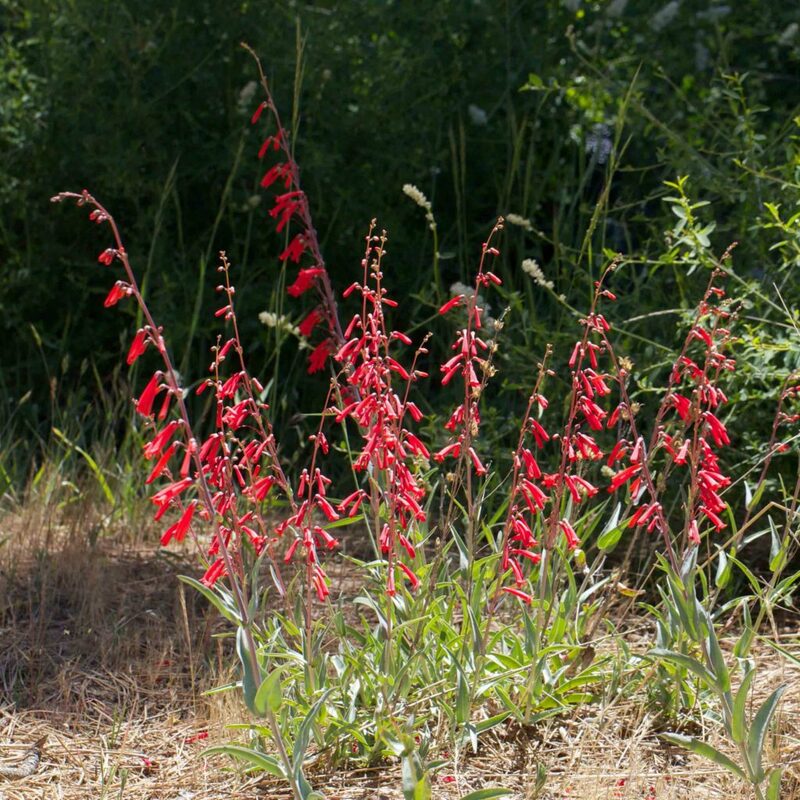 The flowers have features of both putative parents with a color that it is intermediate between them, a beard on the tongue like Grinnell’s Penstemon (though less prominent) and lobes more like those of Scarlet Bugler. 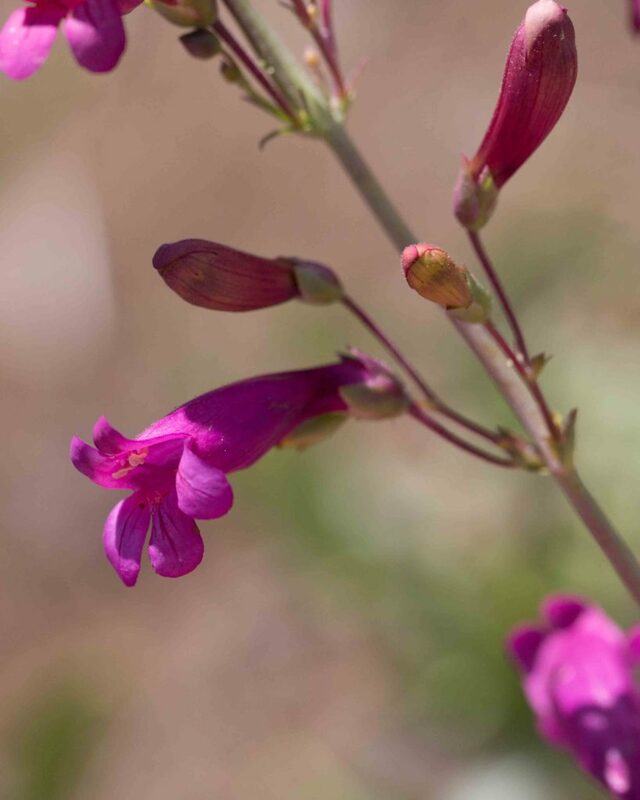 Leaves are more like Grinnell’s Penstemon. 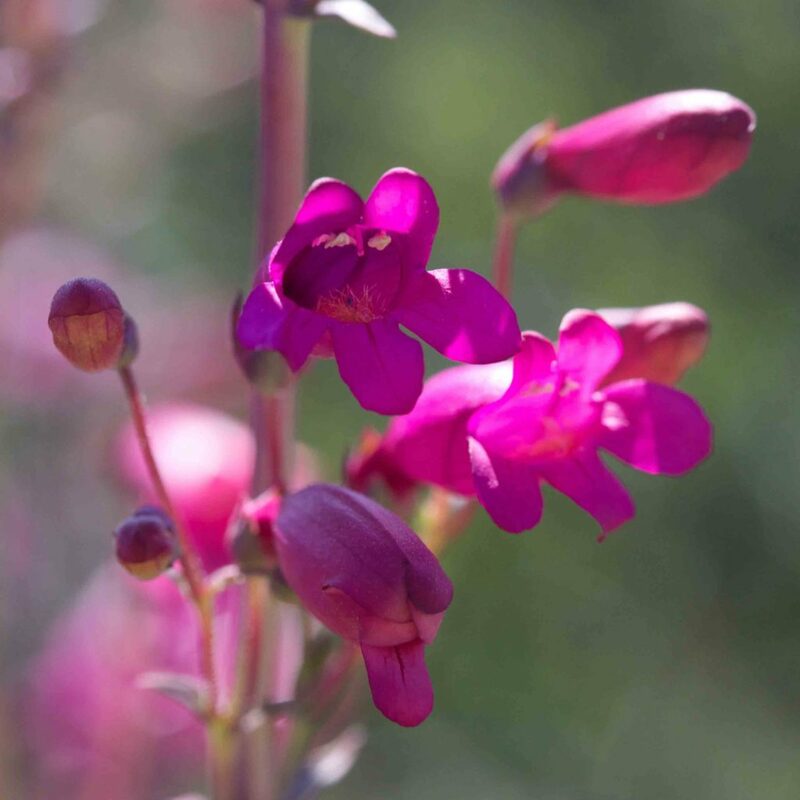 An intriguing plant!